I am a believer in Miracles. When someone asks how I came to Balboa Island, how I bought my house on Balboa Island and how my life has unfolded here. I say it is a miracle. A true miracle. 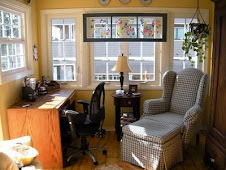 I rented a small office on Agate for our Island Flooring business in December of 1994. There was another office next door - eventually we rented that too. And sublet it to a two decorators - Linda Newman and Carol Bento. It was a great match since Flooring was a fairly new industry for me. Mike has been doing it since the 1970s, but I had been through several changes in my life at the administrative end of a business. I am one of those entrepreneurs who has at least one - and up to four businesses going on at once. Still do. I guess that is part of my ADHD!! Linda and Carol taught me a lot about colors and design and when they moved on Island Flooring had grown enough that we took over both spaces at 118 Agate. Joan McNair, who owned the mixed use building Island Flooring is in, wanted to sell. For the self-emmployed qualifying for a mortgage is not an easy task. Joan was my angel - she carried the paper on the building and once I owned it I could easily get a mortgage from a bank at a lower rate. Unfortunately this was not the smartest move I ever made in my life, banks being what they are today. But owning the building allowed Mike and I to move into the living quarters upstairs and solve the problem of housing on Balboa Island. This is a challenge since people sell, rent to relatives, raise the rent beyond your ability to pay and even pass away on a regular basis here in Paradise. Leaving renters to try and find another place. And the places are getting fewer and fewer as the little beach cottages and residences with back units are being torn down and replaced with single family homes. Ownership has also allowed us to scale back to one unit in this "recession" and rent the other office. The small apartment is a weekly vacation rental after being a yearly for the first 7 years of the 10 that we have been property owners. Now, if I own property in an area with the real estate values of Balboa Island. Without a dime of my own money originally - a banker friend loaned me the down payment because I didn't want to take my money out of the stock market :) If that can happen to me - it is a sure sign that miracles do exist. For me, for everyone. I woke up one morning and heard a small voice tell me that there was going to be a "March Miracle". We all need Miracles. Especially right now. There are Miracles. So let's all pass it on - belive in the 'March Miracle'. You don't have to 'know' what it is - just be open to it. Be able to see it when it comes. It may be huge or it may be tiny - but there WILL be a 'March Miracle' for all of us. Just like there was a miracle for me that let me live and own on Balboa Island!! One of the first people I met when I moved to Balboa Island was Amelia. We lived on the same street - Topaz Avenue. I will never forget when Jim Jennings first drove me to meet Mr. Kelly, my landlord, on Topaz. It was in the evening and the lights had just come on across the bay at the Pavilion. Jim said, "living here you should have no trouble attracting a new man in your life." Eventually he was right. And hopefully it wasn't because of the atmosphere of the street. But that is another story. Amelia and her friends used to go out at night and have fun. One of her friends, Lana Chandler, had a daughter Ashley who had amazing Shirley Temple curls!! I used to babysit Ashley while Lana and Amelia went out. Ashley was about two years old at the time. It is a testament to the passage of time that when I Googled Ashley recently I found she was attending the UC Davis, was 6' tall with straight hair and was a star water polo player!!! How time flies when you are having fun. But back to the subject at hand - Amelia. Every story on the Island has a million side stories. My mind has a hard time staying on just one. Amelia passed away in January. She had been ill for a long time. I used to see her walking every day on the boardwalk, but it had been a couple of years since I had recognized her smiling face among the moms, baby strollers, other walkers and runners. Her funeral service was at St. Andrews followed by a party - and that is the best way to explain it - at Harborside Restaurant in the banquet room. 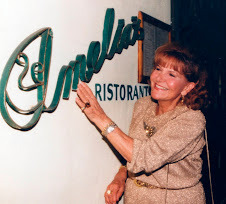 Amelia owned Amelia's restaurant here on Balboa Island (which is still listed on www.balboa-island.com) because she loved to feed people and entertain. This event was a tribute to those characteristics. The food was fabulous. Actually, it turned out one of the cooks had worked for Amelia earlier in his career. The people who knew and loved her were there. Family, neighbors and close friends. Amelia's son and photographer, Randy Seton, had put together an awesome picture story of her life on a big screen tv in one corner of the room. A wonderful picture of her and her husband was next to the tv. We all stood and commented on how happy Amelia looked in all her pictures. How her personality shone through. However, the most inventive part of the whole experience were the centerpieces. They were designed by her good friend Janet Curci from only edible parts - several types of greens, oranges, tangerines, grapes, and peppers. At the end of the event we all got brown paper sacks to take home - "doggy bags" if you will. No one left without a reminder of Amelia's hospitality. I know as I ate the grapes and tangerines and romaine lettuce over the next week I thought about what a wonderful, warm and thoughtful person Amelia was. I moved to Balboa Island in February of 1990. I never suspected at that time that this would be the place where I spent the truly "formative years" of my life. I was 43 at the time and I thought I was all grown up. Hah!! Even now at 63 I am still growing. 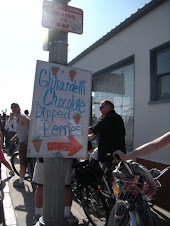 Balboa Island was a wonderful nurturing place to be. I had wonderful role models and neighbors who were always willing to lend a helping hand. I truly miss Jim Jennings now that he is gone. And Joanie Cooper, Nancy Ebsen, Hal Holleman, Nita Wickett, and more recently Amelia of Amelia's restaurant. I am sure I have missed many individuals both here and gone who have lent a helping hand. And it continues to this day. We have had a tough time in our business - Island Flooring. Our fortunes rise and fall with the housing industry and you know where that is right now. We have our building for sale. Almost every day someone stops by or calls and tells us that we cannot leave Balboa Island and that they are praying for us. And that we cannot go out of business - which we won't even if we had to move. 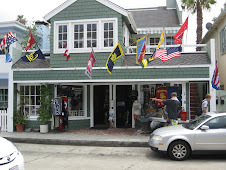 We have been in this business for 40 years - and not always on Balboa Island. Although this is by far the best location. We live above our store and the worst traffic we encounter - as Mike likes to say - "is two-way traffic on the stairs". Balboa Island has been a wonderful place for me. I have lived here longer than I have lived anywhere in my entire life. Not that we moved a lot as a child - but I left for college at 17 and never returned home. So 20 years beats 17!!! It is a wonderful community and I have tried to give back to - by maintaining and expanding the main website - www.balboa-island.com - after buying it from Summer Bress and by writing and hand delivering The Island Breeze to every house on Balboa Island. Thank you Balboa Island for being there for me. It is late afternoon in my office above the Island Flooring office. I sit at my computer and work and enjoy the sun coming in though the french doors. When the summer comes I can open the doors and let the breeze come through. This is a wonderful time of year here on Balboa Island. It is quiet - it seems especially quiet after the hubub of Valentine's Day, President's Day and Ski Week. All I hear in this moment is the sound of water from the fountain on the deck and the drumming of a lone basketball player bouncing the ball on the court at the Beek Center Park. Life is really perfect. And I feel relaxed. Recently I filled out some paperwork and one of the questions was "Where in the World is your Dream Vacation Spot". I answered "home". And that is true. When I first moved here, 20 years ago, I figured I could offset the high cost of rent with the savings in vacation costs. I was sure I would never have to travel anywhere else. I lived in Paradise. And for years Mike and I never traveled. But the fact that we both work and live on Balboa Island eventually had caught up with us. With the small community and cell phones we were always on demand. I remember on one of our first vacations in Vancouver, BC Mike received a call from someone who wanted him to come and measure a job "right now". He KNEW we were in town because he saw Mike's truck driving down the street. If he had looked closely our client would have seen it was Patty, our assistant. Patty had to move our truck on Wednesday because of street sweeping to avoid a ticket. That is when we realized that even though we lived in the most beautiful place in the world - we had to take a vacation elsewhere - to recharge. When we come home, and drive over PCH and look over the Island - we are always grateful that we live in "Paradise Found." Balboa Island is full of wildlife of all kinds - I am constantly updating the pictures to my website www.balboa-island.com with pictures taken by Gar Travis www.garphoto.com He has found taking pictures of animals - both domestic and wild - more gratifying than taking pictures of us humans. We live in a litigious society and animals are less likely to sue!!! I especially love the dog and cat pictures. Sometimes, however, the animals can get a little wacky. We have a huge carport - enough room for seven cars. And it is carpeted with remnants from Island Flooring installations and old area rugs. It is like a huge covered shelter for any animal that chooses to hang out. There is even sometimes a water dish for those that are thirsty. Like a Starbucks for the local fauna. Last spring I had a problem with an animal using the carport as it's bathroom. For reasons I won't detail here - I was sure it was a dog. I wanted to catch that sucker - badly!! I thought about putting a mattress behind one of the carpet displays in the carport and hiding there at night. One of my clients came to the rescue. He sells security cameras and needed a room of carpet. So we traded the cameras and a monitor for carpet and I waited to catch the critter. And waited, and waited and waited!! I knew it just had to be a dog and the owner could now see the cameras and wasn't letting it loose in my area. Oh well, at least the problem was solved. Then the rains came this January. And a present appeared on my carpet. Now I had them - I just had to scan the previous 24 hours on the monitor and there would be my culprit. My big dog. I couldn't wait to find the owner of that wayward dog!! 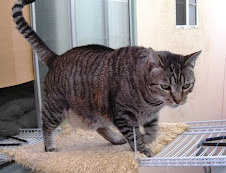 I ran the scan - who appeared - not a big dog - but Gemini - my neighbor's cat! He is probably one of the biggest cats ever, but who knew. Apparently he doesn't like to use cat litter and when it is raining my covered area is just his cup of tea! Gemini sleeps in a bed next to a window facing my patio and I talk to him every day. "Gemini," I said, " I have you on tape and you better clean up your act or I will post it on YouTube and all your friends will see your dirty deed." That worked for a while, but the cayenne pepper sprinkled around the area worked much better. I love you Gemini and I realize you have lost your yard to two huge dogs - but my carport is not your restroom!!!! One morning this winter I was walking alone along the Balboa Island Boardwalk. It was a chilly day, and I was loaded down with my bag of goodies from Cinnamon Roll Faire. I couldn't wait to return home and eat my favorite pastries. Normally I have a walking partner, Kellie Savage. That Kellie was working so instead of walking and talking I was walking and paying attention to my surroundings. Now there is an interesting idea! 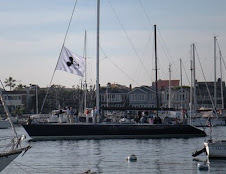 I looked out at the bay and there was a boat with a Mickey Mouse flag at half mast. Strange . . . very strange. Suddenly I realized that Roy Disney, Walt Disney's newphew and a world class sailor, had recently passed away. I knew about the sailing part because Mike loves to sail and pointed out to me on many occasions that Pyewacket, Roy's boat, raced in the Ensenada race and often won. I was lucky enough to have my camera with me, so I took several pictues of the 'Mickey Mouse' boat and the two boats following all of which had a number of people on them. When I got home and focused in on the pictures I found that they were indeed Pyewacket - several of the boats had that name - and I can only surmise that they were taking Roy's ashes to sea. I read since that his ashes were to be scattered at sea - an appropriate place for those who love the ocean and all it represents. I guess this was truly a case of being at the right place at the right time because I never saw any note of it in any print or online media. Balboa Island has a huge community of cats. And cat lovers. And the balance between the two can get very interesting. My cat Magic is 12 years old and has lived on Balboa Island all of his life. He originally belonged to a very nice neighbor of ours named Ginny Soth. Ginny became ill and one day Magic jumped in our window and made himself at home. When I called Ginny she said he was destined for the pound if she didn't find him a new home. Magic had already found his own new home!! Magic is a sociable being. He loves to talk to everyone who walks down Agate Avenue and stops into Island Flooring and Island Style. He always has a story to tell. Magic also ventures down the the Park Avenue Cafe on the corner and begs for food. Because he is a naturally very thin everyone thinks he is starving. Nothing could be farther from the truth. He is fed well - although not as well as he might want. He would have chicken and milk for every meal - topped off with whipped cream!! Magic, however, has allergies. As a result fish, milk and anything that isn't his hypoalgergenic food or chicken will make him very ill.
After much searching I found a solution to my problem. I always thought, "If I could just put a note on Magic." Well I did. K9collars.com, a company outside of Toronto, Canada will put anything on a collar you want - except swear words. I now have a beautiful collar on our Magic that says "Don't Feed Me - Allergies"
It was amazing how many neighbors admitted to feeding our little guy once they saw the collar and understood the problem. Everything from grocery store cat food to tuna fish. I learned my own lesson from all this - I always ask before I give any animal any treat or food. I sit in my upstairs office early every morning. There are french doors leading to a small enclosed patio facing Newport Bay and the Beek Center Park. On the patio is a small fountain. I love the sound of the fountain. I love the sound of fountains in general. My house is a testament to that. There are three fountains in front of my house - two on the back patio and this one on the front patio. Water is a relaxing sound. A great contrast to airplanes soaring overhead. 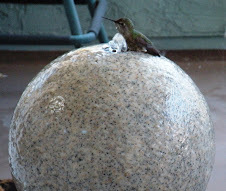 Every morning a small hummingbird comes to take a shower and drink from my fountain. She apparently gets up before the cats because we have many of those in our neighborhood - including Magic, my own cat. More about Magic tomorrow. We humans should take a lesson from that little bird. Yes, she is beautiful in motion - but she is just as interesting, in a different way, when she is enjoying his shower. You can almost hear her sighing with pleasure!!! Then she shakes a bit and takes off until the next day. Life really is about simple pleasures. I have worked constantly for the past two months. Consolidated the Island Flooring and Island Style showrooms into one - rented out the other side to a very nice man who is going to do "fractional real estate". During this time I also went to three Trade Shows in Las Vegas. One by myself for all my sports items - looking for new things to temp the locals and tourists. I just wish USC wasn't so stingy about their licensing. I live in USC country and it seems half of the really classy items I would love to carry aren't available. And they do license some things that I wouldn't put my own name on. 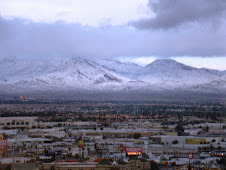 That trip culminated in a wonderful storm arriving in Las Vegas and Covering the mountains there with snow. It was a gorgeous sight. However, that same snow was rain here in the OC and after a few hours at Las Vegas airport I was sent back to town to wait until John Wayne opened up and I could return home. Not to John Wayne - that would have been a long circuitous trip - through Phoenix and arriving at 9:30 at night. Instead I flew into LAX which wasn't so bad for me - but Mike wasn't crazy about driving there - thank Goodness for Garmin!! I came home - did some more rearranging and returned to Vegas. For the Las Vegas Gift Show and Surfaces Flooring Show. All I can say about the gift show is the displays are awesome, the people friendly and the food!!! Yummmmm. Women need to eat or their blood sugar drops. Then crankiness ensues. So they feed you. We didn't even stay for the night time "Chinese New Year's" event - we were too full - and we aren't talking chips here. Lamb kabobs, pesto, pasta, great chocolate and lots of alcohol if you are inclined. The flooring show wasn't as much fun. But since today is my day off - the first since all this has taken place - I am not talking about floors. I am going to walk the Island and enjoy the beautiful place where I live!! See y'all tomorrow. When I moved here 20 years ago, in February 1990 you could have shot a cannon down Marine Avenue and never hit anyone. Balboa Island was a hidden secret. We were mainly a summer place with only the hardiest living here year around. We weren't like the rest of Newport Beach. Most of the people owned summer cottages that had been in their families for decades. The McMansionization of Balboa Island had yet to begin. It is still a beautiful place. But the mix of people is changing. Instead of the houses being closed up because the residents were at their winter homes in Pasadena, Whittier, San Marino, etc. Now there are many who have a third or forth home here on Balboa Island. And many of the summer residents have grown older and retired and moved here permanently. This means the little cottages have been torn down and replaced with single family homes. A way of life is changing - and change comes at a price. But there is always change. The sun is warm and beautiful today and once again the Ferry line is long and I am chasing people off the sidewalks with their bicycles - it is after all called a sideWALK. And ours our very narrow. What a Wonderful Sunny Day. 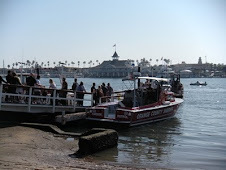 The Balboa Island Ferry Line is winding down Agate Avenue and around the block. 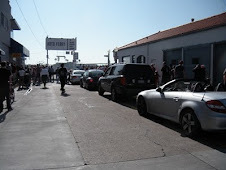 Balboa Island is crowded with people escaping from their homes after the rains which have plagued us for the past month. Even Orange County Airport was closed briefly during those rains. They were afraid that planes were going to "hydroplane" off the end of our short runways. Come to Balboa Island and my little store, Island Style, and throw a coin in one of my fountains - it keeps the algae out of the fountain. Come and see me and buy a flag for your favorite sport team - NCAA, MLB, NFL, etc. This is the perfect day to start my blog - I always have pages and pages of information that do not fit in my monthly Island Breeze newsletter and now I can share on a daily basis. This is going to be an interesting trip.